When I started this blog, I made up my mind that it wouldn’t be filled with tons of book reviews. Everyone reviews books differently, and I think that’s good. If everyone’s book review was the same, how boring that would be! I want to know if the person liked it, if they had issues with it, if they thought the plot was interesting, and if they felt it was well written. Did they have doctrinal issues? Did they think it was boring? Did they think it the best thing since sliced bread? And most importantly, do they recommend it as a good read. 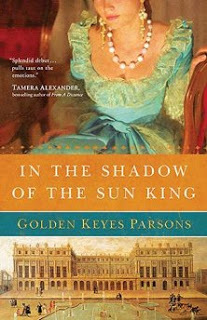 The first book I’ll be reviewing is “In the Shadow of the Sun King” by Golden Keyes Parsons. I am reviewing this as part of Thomas Nelson’s new Book Review Blogger program, which by the way I think is a GREAT idea. At first, I picked up this book with a bit of skepticism. I like historical fiction but usually stick to the US Revolutionary War/Civil War era or Regency England. So I was shocked and delighted when I found myself involved in the story and having difficulty putting the book down. This was one of those rare books that pulled my heart into different directions. I wasn’t sure who to cheer for or what was going to happen. The book was well written, the characters well formed. I feared at the beginning that there wouldn’t be enough conflict or story to keep it alive through the end, but the twists and turns sufficiently kept my interest enough for me to stay up till 1 in the morning to finish it! That’s always a very good sign. I also shy away from historical fiction because authors tend to ‘information’ dump their vast knowledge of their particular era. Ms. Parsons obviously knows her history, and although there was much information given, I never felt it shoved down my throat. She wove in her research masterfully and in just big enough bites to educate me without drowning me in history. My only complaint is that the sequel won’t be out until next fall! Yep, I will self-admit that if I went to a store, this would not have been one I would pick up. I’m glad I got a chance to read it though! WB to my blog by the way:-) I haven’t heard from you in a while!